Robin Minkoff tells us why Prairie Fruits Farm makes the perfect cheese for Earth Day. Back-to-the-landers Wes Jarrell and Leslie Cooperband started Prairie Fruits Farm in Champaign Urbana, Illinois in 2003, sowing buckwheat and modern farming ideals. To start, they planted hundreds of fruit trees and berry plants, and obtained three Nubian goat does and one buck. Nine years later, they produce up to thirteen different cheeses, mostly from the milk of their goatherd. The farm takes on many roles to achieve an admirable goal: educate the local community about the connection between food production and consumption. Cheeses like the young bloomy rind Angel Food are the delectable delivery system of their message. Organic growing practices ensure that the, ahem, fruits of their labors are tasty (Wordplay: rhymes with Earth Day!). 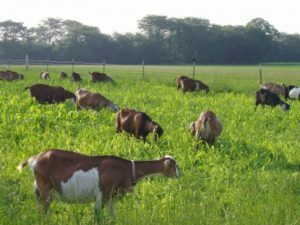 In keeping with the tenets of sustainability and small-scale, diversified farming systems, Jarrell and Cooperband run a pasture-based, seasonal dairy. These farmers take the greatest care with their animals, using rotational grazing methods to keep them on fresh pasture during the growing season, and feeding them alfalfa hay and locally grown grain during the winter. Chickens partner with the goatherd to manage pest control in the goat barn, helping to maintain sanitary conditions and healthy milkers. Because of the careful attention to their animals’ health and quality of life, they are certified as Animal-Welfare Approved. The orchard and berry patch are similarly cared for, deterring pests, weeds and disease through ecological and biological controls rather than conventional herbicides, pesticides, or fertilizers. Flowering plants grow in the orchard to attract beneficial insects, especially honeybees. As a testament to their sustainable agriculture vision, nothing goes to waste at Prairie Fruits Farm: food waste and manure gets turned into compost for the fields, and even excess whey produced during cheesemaking finds purpose as fertilizer and as livestock feed for other farms. Like the cheeses, orchard and berry fruits are sold at local farmers’ markets. One standout cheese, Angel Food, is a soft-ripened goat cheese made in the style of a French Coulommier. Similar to a Camembert, this interpretation is aged two weeks. Beneath the downy white rind lies a gooey creamline and a fluffy paste that melts into a silky, flowing mess of deliciousness as the cheese ages. To make this sensational treat, the curds are hand-ladled into round molds. A ripe wheel of Angel Food can substitute for the Brie you’re planning to serve at your next gathering. But it’s spring – pack it in a picnic basket with a bubbly beverage and some fresh fruit as a part of your outdoor Earth Day celebrations. Sarah, of Prairie Fruits Farm, recommends a Normandy Apple Cider to wash it down. Bring it all together with berries like those you’d find growing near where the goats pasture. Prairie Fruits Farms’ intent is to help connect in their patrons’ minds food production and consumption; be at one with the pure terroir of Angel Food; free of unnatural elements and fresh from the prairie. Angel Food, you make me feel like a natural woman. This cheese is indeed amazing! We wait patiently for each Saturday to get in line and buy them at the farm. Wes and Leslie are amazing people producing delicious food!